This is the Espresso Parisi Decaf Blend brought to you by Parisi Artisan Coffee. 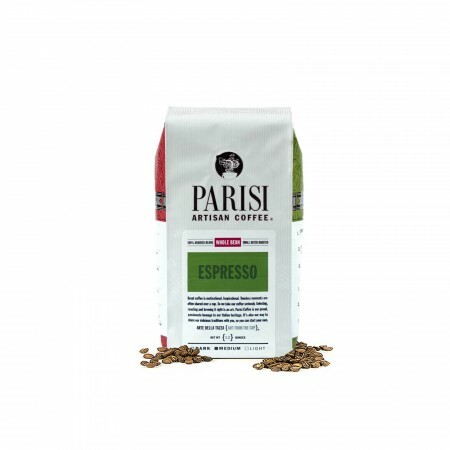 This Espresso is as utilitarian and accessible as Espresso Parisi, but more mellow on the psyche; and as with all Parisi's decaf coffees, Espresso Parisi Decaf is water-processed and therefore chemical-free. This cup is well balanced, with notes of caramel and nuts. As a pour-over this comes out pretty flat with a one dimensional -dark- taste. As an espresso, it actually tastes like a decent espresso with more of the acid notes coming through. Unfortunately, I just prefer the lighter body of a pour-over, and it doesn't shine in that context. Would like more citrus, berry and sparkle. Pretty good; not the best, but a good, solid coffee. This is a good, easy to drink coffee. It is a balanced blend with soft acid making it appropriate for espresso or other methods. That said, this coffee was difficult to dial-in. I tried it with French press and a few pour-over techniques, all while fine tuning the grind size. In all, I was never really able to get rid of the ashy finish. Parisi Decaf is a very safe, somewhat generic, not particularly exciting coffee that makes it a good choice for just about any coffee drinker. Pelease no decaf in the future. Tasty. the nuttiness isn't my top vhoice. I loved it !! I can drink it black which is something I seldom. Wonderful choice!!! This roast was a little darker than I typically enjoy, but it was still well-balanced and smooth. It was definitely good, but not quite at the favorite level. It's a little darker roast than I typically prefer, but it was still very balanced and smooth. It was good, but not in the top category for me. This had a distinct taste that I didn't care for. It seemed a little floral and harsh. I know the description ways it's "more mellow" but I would prefer something smoother without a bite. Probably a lighter blend. Although darker, this has a good flavor. While the aroma of the bean is esquisite, like most decafs, the flavor of the brew feels lacking. There are a few decafs out there that fully embody the flavors/aroma of their caffeinated counterpart, Parisi is not one of them. It is enjoyable but not recommendable. Good but ready to try something different the next time. Thanks. The taste was neutral...not much caramel or nutty. It's better than bitter or burnt, but perhaps not tasty enough to motivate me to buy more of it. We actually did a home taste test against two other decafs that we use, and this one won...but only because it was neutral, while the other two were bitter/burnt. Perhaps the only real negative was that this coffee was a bit too thick and syrupy for me. The coffee is a bit too dark for me. It is in no way a bad coffee but I prefer coffee with more acidity and brightness. Nice coffee a little bit on the bitter side. This is my favorite roast so far. I love the flavor and the smoothness of it. It seems less acidic than the other roasts. I'm not sure if the fact that it's water-processed has anything to do with it, but the fact that it's chemical-free is a good thing, in my opinion! Better as espresso than drip. Quite good although nothing about it really stands out. Enjoyed the nutty notes. ok my previous 2 star was a little harsh. I think really I just liked the prior Dillanos so much. I think that is was not as smooth as the Dillanos, occasionally I would get a more sour note than I like. My husband (who is the coffee maker) thinks that it is a darker roast than I like. I really enjoy the soft nutty taste but especially like the caramel. It smooths out the coffee. I usually add creamer to my coffee and I do not need to with this coffee. It has its own creaminess. I was a little skeptical when I saw espresso thinking it would be bitter and too dark for me, but not at all. This is an excellent coffee. I really love the caramel.